Today new (short) video about my last folding camera StenopeiKa 45se2. This time I want to show you the possibilities of movements that the camera offers you, the real strong point of this folding that wants to be a monorail view camera therefore with extreme movements, but with possibilities to shoot outside because the space occupied by folded is relatively little. The video is very “dancing” i hope you like it. Today is a great day! 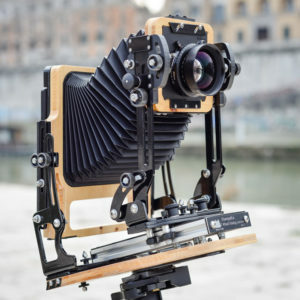 Is the day of the official presentation of the new 4×5″ folding camera, model StenopeiKa 45se2. After many months of testing with photographer Giulio Speranza (thank you for the pictures) and me I’m finally ready to launch this camera that is “younger sister” of the legendary StenopeiKa 810se2 folding camera, in fact it takes up almost all the mechanics, obviously re-adapted to the 4×5 “format, but keeping the thicknesses and then returning a truly solid and indestructible camera. Tilt from baseboard: 90° onwards-limited by the bellows back. 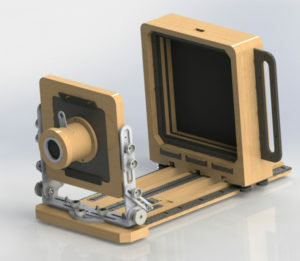 Like all StenopeiKa cameras is available in iroko wood, cypress and … olive wood! As I wrote in the title, the camera is completely magnetic (except for the lens board) and in the video you can see how it self-assembly, and how easy it is to change the chassis from vertical to horizontal and vice versa. In wishing you a happy new year, I leave 2017 with a new video: 3 reasons to choose tailboard modular camera. 3) You decide how much spend: thank to the configurator you can choose your favorite configuration based on the budget and technical needs of the moment, quiet that in the future you can change the configuration without having to spend for a new camera. should i change idea in the future? at any time you can change configuration without making changes to the camera and decide how much to spend. With this new video, this week, i would like to show you the possibility of tailboard camera; the small camera size despite the giant size (11×14 “is really big), the low weight, and the possibility to build as you want thanks the a wide range of accessories available, every, or almost, magnetic. 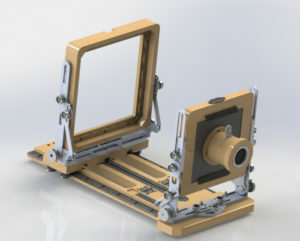 Like every time that i present a new camera, i have a special offer for that you follow me, if you insert your date bellow, you’ll receive 3 video extra with the secrets of StenopeiKa 11×14″ tailboard modular camera and, if you follow and accept the offer, a large format accessory for free. Today i’ll show you the details of StenopeiKa 11×14″ native wetplate holder and 3 good reasons to to use it. So the first one is a technical reason, this holder is different from the commercial holder because it is not plugged into the camera but it is attracted to the camera so the accidental movements are avoided during the insertion phase, because if you use this holder you don’t have a insertion phase! The second one is esthetic reason, this holder resemble perfectly the external camera profile, obviously i speak for Stenopeika cameras, folding and tailboard, but with some modifies i could make it also for a other cameras. The third reason (I didn’t say it in this video, but i’ll explain better in the next one) is that the holder accepts plates up to 4 mm in thickness, one of the few in the market to accept such thick plates. BUT TODAY I HAVE ALSO A GIFT FOR YOU! Only for you who follow me on the blog and on the social, I have 3 more videos with extra content where you can discover the secrets of the 11×14″ wetplate holder and special gift. 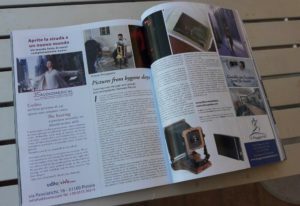 Click here and follow the instructions to wach the video and find out the secret of StenopeiKa wetplate holders. 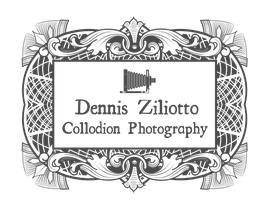 Today is the time for interviews, so i ask to Dennis Ziliotto if he want to say some words about wet plate collodion photography, Stenopeika cameras, and the sense of photography. I think it’s very interesting so I decided to share it with you. After many request i made a videos (2 this time, one in Italian and other in Tuscan-english for my fans) when i try to explain the most important difference between tailboard camera and folding camera. Opening setup: the open setup of tailboard is more quick and easy than folding, but folding, when is close, is smaller and lighter than Tailboard. 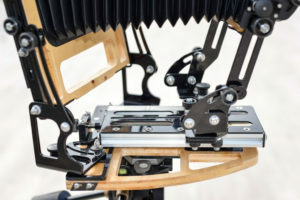 Open and close system: tailboard is an “open camera”, in any moment of camera life you could change camera parts, increase the format, the length, add movements and so on without changing on the camera, the folding camera is “close camera” you can’t increase or change format in a second time. Bellow the two videos and links for more details of the two cameras. 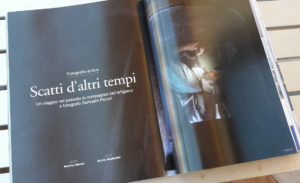 After the article about me and my products on Naturart magazine, i made a collodion portraits session to Tesi brothers at Giorgio Tesi Foundation in Pistoia, Italy and also i made a video to say thanks to the art director of magazine. To made this portraits session i used my StenopeiKa 5×7 tailboard modular camera with native wetplate holder, and my Sine-igne 200 f4 wooden lens, extremely sharpness in the central part of fram and fine focus on the edges, this combination is perfect for collodion photography, especially for portraits. 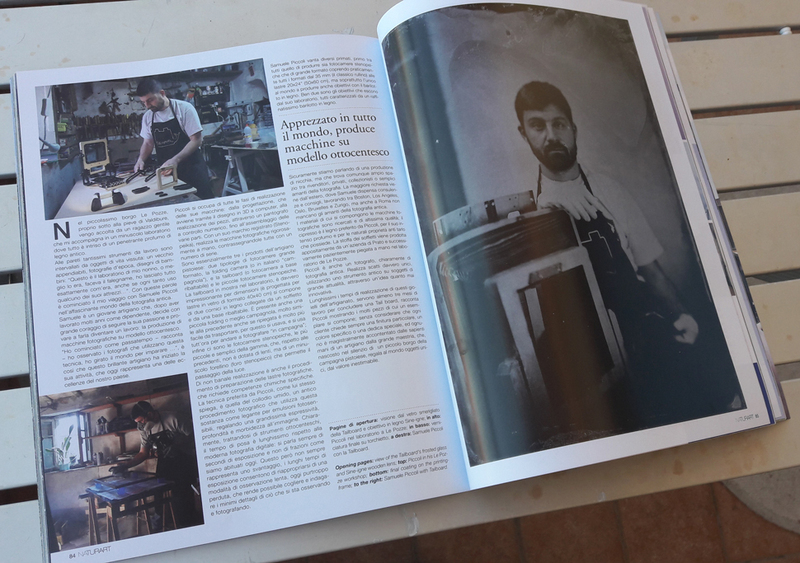 I add also the picture of the Narturart article and the video below. after the presentation of my new StenopeiKa 8×10 tailboard modular camera, i received many questions about this modularity. For that reasons i made a video (here) to show you the simplicity of the operation (change the format with same camera) and also i write this article to explain better the other possibilities of tailboard camera. So, to made the video, for test and for workshop, i always use a 5×7″ tailboard with a start configuration without movements but with native wetplate holder (rendering on the left, without bellow). 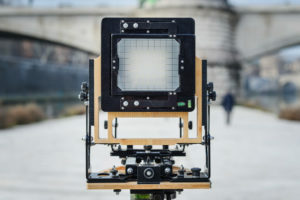 In this configuration the focus glass in on other magnetic frame, magnetic like frames bellow and native wetplate holder, that you remove after the focus setup. How i tried to explain in the video, as well as changing the size simply by changing the back body, you can add baseboards (and back bodies) to stretch the bellows extension as you want. In the picture on the right you could see an example of this kind of configuration (standard camera + 1 additional base board + 1 back body + 1 bellow not in the picture), note well that you can re-use the same wetplate holder. In addition to this, as I said in the last video, the bodies can be changed with others having the movements, like the next pictures. 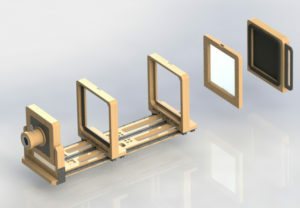 The bodies can be changed at any time, also the addiotinal base board. 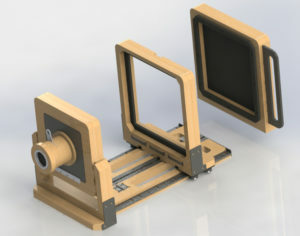 With the top configuration you will have a camera with movements like monorail view camera but easier to transport. So… why do you wait again?